Posted on December 4, 2013 by Kristin Posted in General Announcement	. I care about the small things. I worry about what I put into my body. I believe that all-natural is better, but I also believe in educating yourself and trying out new products. That’s why Melaleuca fits my lifestyle. I have found a way to combat my biggest issues, like acne and bad breath, using Melaleuca. Today, I am sharing my top three beauty products…and they are all under $7!!! First impressions are everything. Unfortunately, I have had acne rosacea my entire life. It is so embarrassing. I would cake make-up on my face in high school to cover up the bumps, redness, just all around grossness of my face. I tried Proactiv. I tried every face cleanser in the drug store. Nothing worked. I remember one day I was sick and I went to the doctor. As I am freaking out because I was just diagnosed with swine flu, he says, “Yea, you’re sick and I’ll give you an antibiotic but would you rather we talk about your face because your breakouts are really bad?” I ran out of the office crying. It’s embarrassing and if you’ve never had the opportunity to be the pimply faced kid in school, you have no idea what I’m talking about. 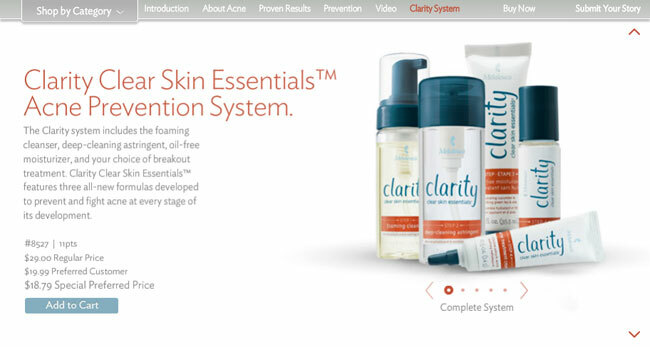 One of my very first purchases when I joined Melaleuca was the Clarity face wash. I was excited to try it and skeptical because why would it work when I was on medication in the past for the same thing and even the meds didn’t work?! Within a few uses, I noticed the redness was starting to fade on my face. My skin got a little dry and flaky but nothing that I wasn’t already used to. Plus, if you buy the face wash and moisturizer, it works wonders. I’m not saying my face is completely healed. I have a lot of scarring that is probably never going to go away. Certain areas are still red, like around my cheeks and the temples of my forehead, but when it comes to the overall look, my skin is so much healthier! A little TMI, but just to let you know how this next product has helped me, I have always had sensitive gums. No matter how soft of a bristled toothbrush I buy, my gums always bleed. It’s gross and I hate it, but I’ve never found anything that works, so it was just the way that it is…until I found Melaleuca. I’ve been using a regime of mouthwash and toothpaste that has helped my gums extremely! So much so, that I no longer bleed when brushing my teeth. Too bad I didn’t find this product earlier in my years. It was so embarrassing when I slept over at a friend’s house or we had a girls’ night and everyone was getting ready in the bathroom and here I am spitting blood into the sink. Gross! I bought a tube of mouth polish and mouth rinse from Melaleuca and I could see a difference immediately! I could taste a difference, too, as the Melaleuca products are all-natural and the mouth rinse has a fresher, crisp taste than Listerine. I love fresh scents, but I can’t buy anything floral, old-lady smelling, or musky. I used to buy unscented, for sensitive skin body wash. It was the only body wash that didn’t make my skin break-out. Sure, I wanted to smell like coconuts or vanilla and honeysuckle, but my skin wouldn’t let me. One bottle of Body Satin later, I can smell like whatever I want! Right now I have the Island Sunset scent which my boyfriend loves because I smell like the beach and it reminds him of home. The rich lather suds up just as well as my over-the-counter stuff. I love it because it gets my skin soft and the smell isn’t overpowering. If you’ve been blessed with having no health/allergy problems and none of these issues relate to you, then congrats and I’m super jealous. If you are like me and you know the embarrassment of these issues, I urge you to try these products risk-free. Everything is 100% refundable. If you are not happy, you will be reimbursed everything, including your $29 one-time membership fee. Give yourself a break and shop smarter, shop safer and save money with Melaleuca. Tags: acne, all natural, bad breath, beauty products, body wash, face wash, green, melaleuca, melaleuca oil, miraclean, natural solutions, tooth paste	.